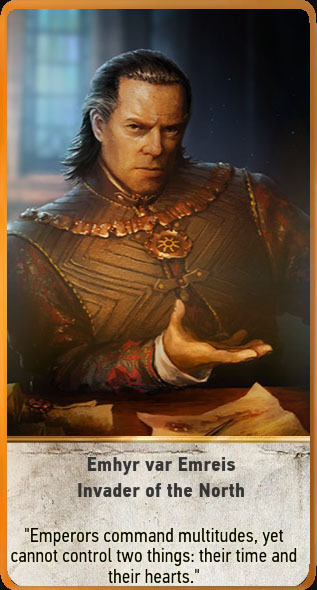 - Emhyr var Emreis: Nilfgaard (leader); Get a randomly choosen units from your discard pile back to the battlefield; you will receive the card from the caravan merchant at Vegelbud estate. 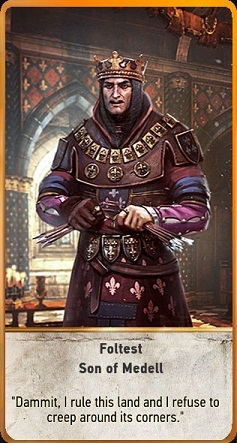 - Foltest Son of Medell: Northern Kingdoms (leader); You will receive the map from the caravan merchants at Vegelbud estate. 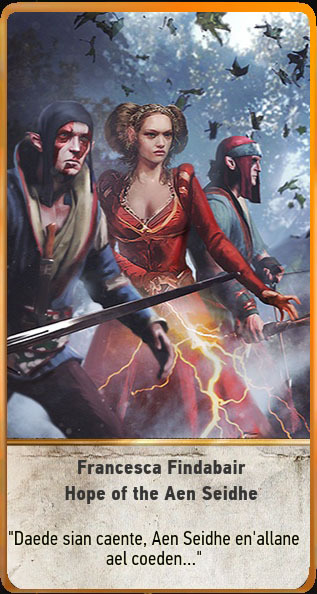 - Francesca Findabair: Scoia'tael (leader); Move agile units in the optimal range; you will receive the card from the dealer at a waypoint in the Novigrad new mill. 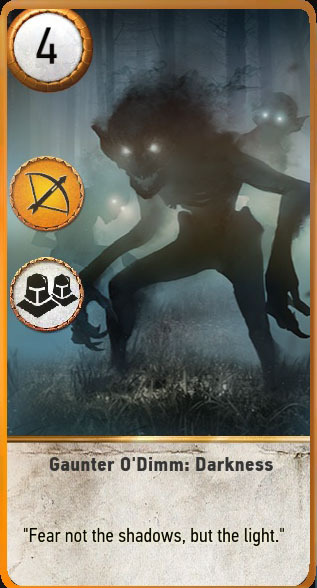 - Eredin Breacc Glas: Monster (leader); Double the strength of all spies; you will receive the card from the dealer at a waypoint in the Novigrad new mill. 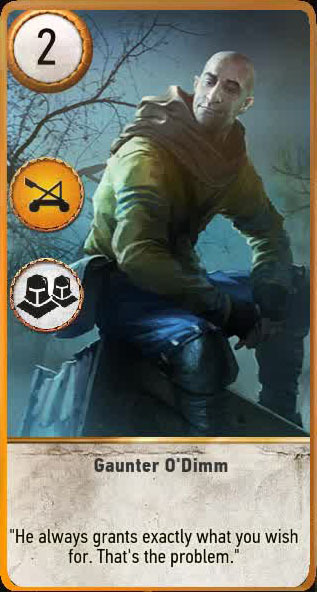 - Schirru: Scoia'tael (siege); Eliminates the strongest siege enemy units if they have a total strength value of more than 10; You will receive the car from the caravan merchants at Vegelbud estate when you defeat him. 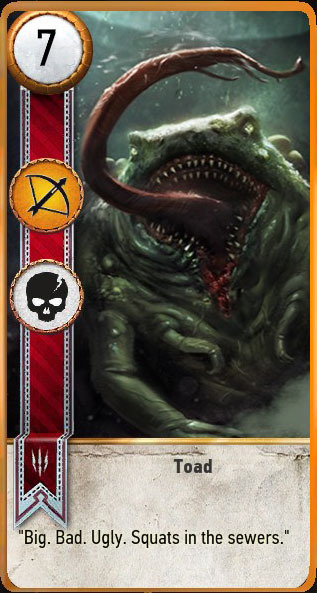 - Toad: Monster (ranged); Eliminate the strongest ranged units of the enemy, if they have a total strength value of more than 10; you will receive the card, once you defeate the Olgierd von Everec. 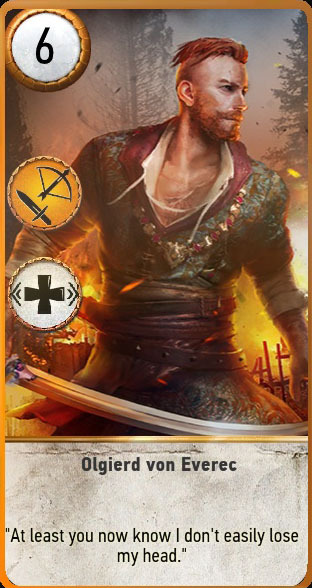 - Olgierd von Everec: Neutral (ranged and melee); Morale Boost: Is all unit cards in the same row +1 starch (except yourself); you will receive the card once you defeat Shani. 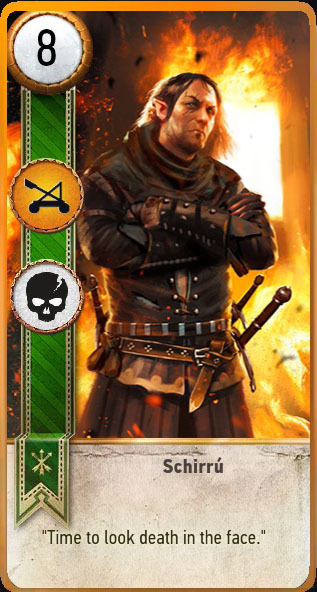 - Gaunter O'Dim: Neutral (siege); Muster: Find cards with the same name in your card deck and play them directly; you will receive the card, once you defeat Hilbert at the auction house during the quest Open Sesame. 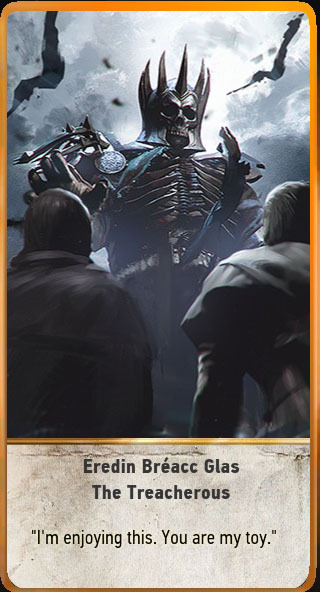 - Gaunter O'Dim Darkness: Neutral (ranged); Muster: Find cards with the same name in your card deck and play them directly; you will receive the card from the dealer at a waypoint in the Novigrad new mill. 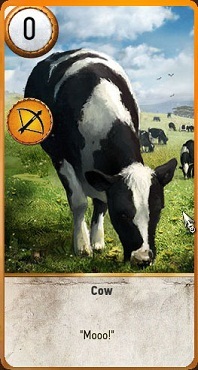 - Cow: Neutral (ranged); you can find the card in the barn during the wedding.